The shoulders of Cove Point Road in Lusby, Maryland are looking pretty ragged these days. Recently, heavy trucks and construction vehicles have crumbled the pavement as they thunder down the narrow road. Not far up Cove Point Road from the main highway, just past the sometimes clogged intersection with H.G. Trueman Rd., they turn left and enter the gates of the LNG plant that's been there for 40 years, but is now undergoing a major upgrade. The road also looks a little brownish from dirt spilled by dump trucks. Early in the morning on Sunday, May 31, there was no traffic to speak of when two cars with Pennsylvania license plates negotiated the gentle turns and hills of Cove Point Road. A police cruiser followed them. Soon after Cove Point Road turned into Lighthouse Blvd., the two cars, still followed by the police cruiser, turned onto Holly Drive. Blue lights flashed. A sheriff's deputy wearing olive green pants and a black shirt got out and approached the first car. "You don't belong here," he said. "You're not welcome here." As he leaned in, a white badge dangled from a lanyard around his neck. It read, "Dominion Contractor." What happened over the next hour--an "investigation of suspicious vehicles" by ten officers and a drug-sniffing dog, which culminated in an arrest--might be traced back to the fact that the white badge had a flip side. When Dfc. Christopher Sloane turned it over, it suddenly became a Calvert County Sheriff's Department badge on a black background. The badge's two sides, and the ease with which they were switched, represent an unusual arrangement in Calvert County between its local law enforcement and a giant corporation. Through a security services agreement, Dominion Cove Point, the operator of the LNG plant on Cove Point Road, funds the salary of ten sheriff's deputies, including Dfc. Sloane. They essentially have two employers, the taxpayers of Calvert County and Dominion Cove Point. The six passengers in the cars which were stopped and searched had participated in protests against Dominion's Cove Point project, including one the previous day. 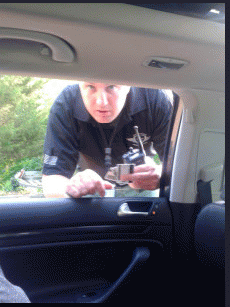 Within minutes of being pulled over, the head of security at Dominion Cove Point showed up. "I smell something funny," said Officer Sloane, calling in a K-9 unit. Dfc. Bortchevsky also declared that the second car, driven by Matt Weaver of Pennsylvania, "smelled like pot." According to Weaver, it was Officer Bortchevsky who smelled like marijuana. His eyes were red-rimmed, bloodshot and glazed. All the passengers' I.D.s were run through the system. If county law enforcement was infected with xenophobia, it should have been soothed by the fact that two passengers were locals. "We told him we were guests of a resident of Cove Point Beach, but he seemed determined to find something to pin on us," said Donny Williams of Lusby. They had turned onto the side street to call for directions after they missed their turn. Two residents came to vouch for them, but it went nowhere. Everyone was patted down, their pockets searched. After being sniffed by the dog, the cars and their contents were meticulously searched. The deputies looked for false bottoms on water bottles, rifled through a backpack full of clothes, and flipped through and read notebooks, supposedly looking for drugs. They took one notebook back to the station and photocopied it. It was surreal, "a weird scene that didn't make any sense," said Caitlyn Rorke of Baltimore. "Some of us were getting really frightened." The extensive rummaging eventually came up with pay dirt: unlabelled pills. They turned out to belong to Rorke, who, for convenience when traveling, had put a few prescription medications in a single bottle instead of bringing all the original bottles with her. She was arrested and charged with possessing controlled, dangerous substances (Schedule 2, 4). She was later released without bail when a commissioner found that she was held without probable cause, but she must still appear for a court date later. Anne Meador is a co-founder of DC Media Group, a grassroots collective of journalists devoted to covering the news and issues from the people's perspective. Climate Expert James Hansen: "We've Got An Emergency"
Fed Up With FERC: The People Declare Greed "Not In The Public Interest"